Seal time rifts which have appeared across Skyrim and Morrowind. A new cluster of time breaches appeared in northeastern Tamriel—specifically the lands of Stonefalls, Eastmarch, and The Rift. As an agent of the Psijic Order, I need to seal them. Talk to Loremaster Celarus in the main hall of Ceporah Tower or Josajeh in the Athenaeum of Ceporah Tower. Talk to Josajeh and take the Psijic Map of Morrowind and Skyrim. Talk to Josajeh in the Athenaeum in Ceporah Tower. Yes, I'm prepared. What do I need to do? "Our seers detected a new cluster of breaches in the lands of Morrowind and Skyrim. The elder members of the Order don't want to admit it, but I'm afraid these distortions are growing stronger. But there's good news! We think we found the cause." "The Loremaster and I. While you made your way across Alik'r, we reached out with projections—looking for objects of power. We found one. The Staff of Towers. The Loremaster's confident we can find it. You should speak with him when you return." All right, I'll travel to Skyrim and Morrowind and seal these time breaches. "Thank you, initiate. I honestly don't know what we'd do without your help. I keep telling the Loremaster I can assist you. I mean, I did spend my entire childhood on the continent after all. I suppose he knows best." You mentioned the Staff of Towers? "Yes! The actual staff, created by the arch-mage Anumaril in the first era. If we're right, this could be the greatest arcane discovery in millennia! According to the Psijic histories, the staff could bend and shape time itself." And you think that's what's stirring up these time breaches? "We can't say for certain. Yet. I should warn you—the Loremaster finds this all very troubling. Magical artifacts always present a destabilizing influence. You know by now that a lack of stability does not sit well with our Order." You're not concerned about it? "I'm very concerned! An artifact left out in the wild for any hedge-mage to find ... the results could be disastrous! It should be here on Artaeum. I need to get back to our research. We should have more answers when you return." 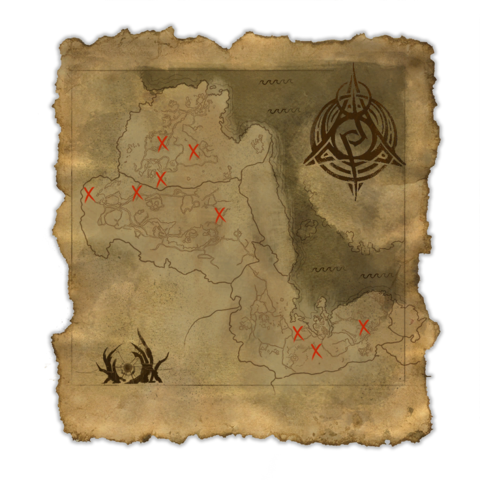 You receive Psijic Map of Morrowind and Skyrim and 9 Psijic Seals. Examine the map in your inventory. Between two lava streams on the west side of Senie (map) Looks like a buyer's market around here, eh? Got to tell you, I see a lot of potential, mate. Lava-front views, open floor-plan, plenty of ventilation .... It's a gold mine! On an island in the river north of the Brothers of Strife, above Armature's Upheaval (map) Definitely a breach nearby. And ooh, it's a rowdy one! This place is tense, eh? Might have something to do with the mountains strangling each other. Who's to say? On top of the ridge above Vivec's Antlers, on the west side (map) What a view! Aside from the coral over there. Be glad your silly face-holes can't smell colors. Ugh! That orange! It smells like ... old figs fell out of an ogre's bottom. Let's find this breach, eh? Next to one of the larger steam pools at Wittestadr (map) Breach ho, mate! While you look, I will regale you with a hilarious joke! What do you call a lygosmotic dream-wave on its birthday? A ventswattle! Get it? A ventswattle? Oh, never mind. Across the river from Darkwater Crossing, by the waterfalls southeast of Fort Amol (map) Be careful around here, mate. This breach is surrounded by trolls. They're a lot smarter than you think. They're banging rocks together now, sure--but once they start wearing pants? Look out. In the river by the bridge east of Cradlecrush (map) Snow! Can we make a snow-thing? Snow-person? Whatever? You know, if you make it right, it develops a sad little soul! 'Course it melts later. Bit of a shame, that. But we can name it and everything! Northeast of Fort Greenwall (map) So, Staff of Towers, eh? Lots of peril there, mate. I've got to admit, though, I'm very exited to see how it turns out! I'd say, what? Sixty-percent chance time folds inside-out? We'll see! Just outside Snapleg Cave (map) This stream's a pleasant enough place for a breach. Just watch out for beavers, eh? Sure they look friendly enough--but they're just little waddling balls of hatred. Seriously! At the top of the steps near the Throat of the World, west of Ivarstead (map) Another breach ahead, mate. Uh oh. I see many many stairs in our future. Well, your future. No legs, remember? But don't worry--I'll be right behind you ... doing very little. "Ah, greetings, initiate. You arrive not a moment too soon. I assume that Josajeh gave you a summary of our predicament?" "The Staff of Towers has returned. I was skeptical at first, but there is no longer any room for doubt. Josajeh made the discovery—an exemplary feat of arcane inquiry. I find myself filled with a mentor's pride ... and no small measure of dread." Why is the Staff of Towers so frightening? As a member of the Psijic Order you must know that great power always walks hand-in-hand with great peril. Even in the hands of a Ritemaster, an artifact like this can churn up untold horrors. Truth be told, it already has." "Misuse of the staff led to something called a Dragon Break in the First Era—a catastrophic disruption of linear time that lasted the better part of a thousand years. Trust me when I say that is something we cannot afford to repeat." "The threats we face are grave indeed. Fortunately, the Old Ways always provide. Wisdom in the face of uncertainty. Patience in the face of turmoil. And of course, strength in the face of danger. Take this, initiate. And my thanks." I should talk to Josajeh before I head out. I should review the map of Time Breaches in Stonefalls, Eastmarch, and The Rift to plan my route. I must explore the lands of Eastmarch, The Rift, and Stonefalls. My map should help narrow the search. Once I arrive at the X, I must use the Augur to find the breach and the Psijic Seals to close it. I successfully sealed all the time breaches in Eastmarch, The Rift, and Stonefalls. I should return to Loremaster Celarus. Josajeh said he'd like to speak with me. Finishes quest I must talk to Loremaster Celarus to complete my task.